Callen Construction is celebrating it's 40th anniversary! A heartfelt thank you to everyone who supported us, helped us grow, and journeyed with us from 1968 to 2008. We started with one truck, now fully restored for parades (pictured at right), and grew to become the company we are now. We couldn't have done it without our family, our clients. 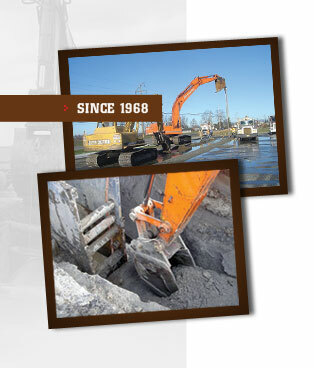 Founded in Custer, WA in 1968 by Gene Callen, Callen Construction started with not much more than a small dump truck and a backhoe. The company was taken over by his son, Cleo Callen, in the mid 1970's and has continued to grow ever since with a focus on heavy civil construction projects ranging in size from $100,000 to $4,000,000+. The company has always been a family-run business and now has several members of third generation working within the company. Callen Construction prides itself on its dedication to quality and hard work. The company was founded on these principles and they remain at the core of the company to this day. With the majority of our work being in Whatcom, Skagit, and Island counties, this area is not just where we work, it is where we live. It is our goal to provide a quality project on time, and under budget on each and every project that we set out to do. Safety is a top priority here at Callen Construction. We are continually updating our safety program to stay current with all industry regulations and keep our employees safe. We conduct safety meetings on a weekly basis and prior to any high-risk activity. We also hire safety professionals to do in house training with our employees. All Callen Construction employees attend Firs t Aid and CPR classes. All management personnel attend competent person training seminars for Trench Safety. Callen construction strives to stay on the cutting edge with new technologies and software such as Trimble GPS on our grading equipment. This enables us to be more efficient in our work and ultimately save our customers time and money. We have in-house survey capabilities which allow us to reduce staking costs and perform value-engineering activities in a much more efficient and cost-effective manner. In addition to GPS and survey equipment, Callen uses top-of-the-line estimating and project management software to bid and track job costs more effectively. Some of the software programs we use include Agtek, AutoCad, HCSS, and Spectrum (Forefront). Callen Construction has adopted a philosophy of continuing education from the top to the bottom. Personnel from lead men to company owners are continually attending courses in related to safety, management, and technology to further advance company knowledge. We realize that our employees are our most valuable asset. We make it a point to hire the best personnel for every position. We take good care of our employees and offer great benefits and pay rates to ensure low employees turnover.